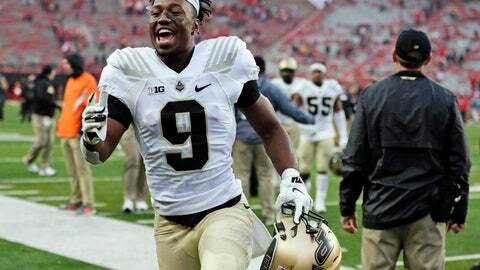 The Purdue Boilermakers finally look like the team Jeff Brohm envisioned. They’re improving on defense, making big plays on offense and are chalking up wins. After a slow, mistake-prone start to his second season in West Lafayette, Brohm suddenly has the Boilermakers back on track and ready to jump into the Big Ten’s West Division race. Maintaining momentum won’t necessarily be easy after taking last weekend off. Yet Purdue (2-3, 1-1 Big Ten) never seemed to be too far off. It blew the first two games on late personal foul calls and lost their third straight after a replay review overturned a go-ahead touchdown — a call Big Ten officials later said should not have been reversed. The Boilermakers then responded with a stunningly convincing upset over then No. 23 Boston College and followed it with a win at struggling Nebraska. Now Brohm is hoping last week’s bye won’t slow his improving team down when it heads to Illinois (3-2, 1-1) on Saturday. The other big factor has been the play of quarterback David Blough. After losing the starting job in preseason camp, Blough replaced Elijah Sindelar late in the first half of the season opener. After splitting time in Week 2, Blough became the full-time starter duties in Week 3 when Sindelar went down with an undisclosed injury. He played the final 3½ games last season with a torn anterior cruciate ligament in his left knee. But Blough’s re-emergence has made everyone forget about Sindelar’s absence. Blough has completed 85 of 125 passes for 1,196 yards with seven touchdowns and only one interception over the past three games. He also rushed for two scores during that span, breaking Curtis Painter’s single-game school record for yards passing with 572 and the Big Ten’s single-game record for total yards (590) in a Week 3 loss to Missouri. And he’s excelled despite losing one of Purdue’s most reliable targets, tight end Cole Herdman, with an undisclosed injury two weeks ago. Brohm said Herdman has “improved greatly” and a decision on his availability this weekend could come as soon as Tuesday. Regardless of Herdman’s status, though, the Boilermakers look like they’re back in sync at just the right time.